NEW DELHI | HYDERABAD | MUMBAI: If there’s one time it’s not easy being a politician in India, this is it — in the midst of a general election — when even the most privileged of people’s representatives must physically reach out to voters in the sapping heat and swirling dust of Bharat where a proffered glass of water can neither be declined without causing offence nor accepted without a sense of impending doom. More’s the envy then that many of our politicians seem to defy the elements, even in their ripe age, and stay fighting fit throughout the campaign that lasts well over a month in some places. How do they manage this feat? Is it merely the lure of power at the end of the often back-breaking road? ET found out that food plays an important role as most politicians, seasoned campaigners and the younger lot alike, take care to eat light and stay hydrated during the long hours. 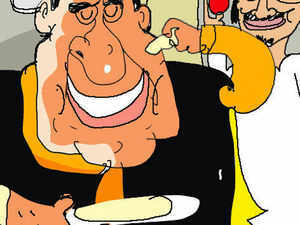 Home minister Rajnath Singh, 67, for instance, has light vegetarian meals that are close to home-cooked food. Being a senior leader, he usually travels in a chartered plane and hops on to a helicopter to reach rally venues. The flight attendant usually has a simple food menu for him and his team of around four people. Many other star campaigners have lunch that is arranged for them at venues by local party leaders. Seasonal and dry fruits are offered to them by the hosts at some venues when they are leaving, for consumption in between meals and during the chopper ride to the next venue. Most campaigners avoid dry fruits and stick to seasonal fruits and water during summer. Congress leader Ghulam Nabi Azad, 70, is an indefatigable campaigner who remains unfazed even when temperatures soar above 48 degrees. He often campaigns throughout the day in scorching sun without showing any signs of fatigue. He keeps sipping honey water intermittently, but avoids heavy meals while campaigning. His vehicles are loaded with honey water, which helps run the election campaign. “It’s a trick I learnt from the Scindias,” he said. These days, instead of a routine of 12-14 hours a day of interacting with officials of various departments and visiting projects under construction, he addresses the public while touring various towns and villages across the state, apart from being closeted with party leaders and workers to discuss election strategy. Naidu gets up around 4 am daily and spends nearly an hour on yoga, breathing exercises, treadmill and cycling, and sometimes even swimming. He has oats, millets, boiled or cooked organic vegetables, egg whites, fruits, nuts, milk, buttermilk, coconut water and juices in small quantities five-six times a day, served by one of his two attendants. Instead of going to bed around 11 pm, as he usually does, these days he reaches home only after midnight. His counterpart in Maharashtra, chief minister Devendra Fadnavis, 48, also takes care to ensure that he does not eat outside food or junk food. Similarly, Nationalist Congress Party chief Sharad Pawar, 78, has his meals specially prepared for him. In Rajkot, BJP candidate Mohan Kundariya, 67, said campaign time called for a change in food habits. “There is neither time nor scope for routine food during campaign phase. None of us has that luxury in this period to have a planned diet,” said Kundariya, who did not let the heat wave in his constituency lessen the intensity of his campaign. “Amid heat conditions all we do is drink plenty of water. Not just me, I have asked my workers also to ensure that they drink enough water to avoid dehydration,” he said. Most politicians in Maharashtra have their aides carry their ‘dabba’ (tiffin) packed from home. One of the compartments in the dabba consists of dry fruits while the other has non-oily home-cooked food. Several younger politicians across the country such as Aam Aadmi Party’s East Delhi candidate Atishi Marlena, 37, also pay special attention to the food they consume during campaigning. She said she generally starts her day with a morning walk and a cup of coffee. She heads out of her home in central Delhi around 8 am with a dabba in tow that usually contains cheela for energy and fruits to keep herself hydrated and upbeat. She skips her lunch almost every day as most of her campaigning in her constituency happens during the afternoon. She usually gets to eat what her colleagues now call “early supper” at around 5 pm in her office in East Delhi’s Geeta Colony. Dinner happens late, usually in the party war room, with Marlena and her colleagues coming back to the comfort of dal chawal every night. Chana dal is a favourite. As campaign meetings generally spill over to past midnight, coffee and a couple of rusks usually keep her and her colleagues awake at night. In Mainpuri in Uttar Pradesh, campaigning for party leader Mulayam Singh Yadav, Samajwadi Party leader Tej Pratap Yadav, 30, starts his day at 9 am from Saifai with a breakfast of poha or daliya. He addresses a dozen small meetings during the day and doesn’t have any full meal. “I mostly eat fruits which party workers arranged at some of the meeting places,” he said. After every speech, when he is back to his car, he immediately drinks a small bottle of water followed by a Diet Coke. “I drink a lot of water to keep myself hydrated in the summers,” he said. Yadav has only one full meal, at night, once he comes back from campaigning. “It is always around 10 pm since after coming home I meet a lot of party workers and plan for the next day. I take a light meal of dal, vegetable and chapati to remain active if needed,” he said. He loves sweet dishes but avoids them during campaigning to protect his throat, he said. With temperatures set to rise further in the coming days, along with political intensity of the hard-fought election, Yadav and other politicians can scarcely afford to let their guard down.